Erin O’Connor in a Stephen Jones hat. Photo: Nick Knight. Image: SHOWstudio. Royal Ascot begins tomorrow. What better way to celebrate than with a free designer millinery pattern, for a Stephen Jones hat called “Nice Package”? Photo: Peter Ashworth. Image: Stephen Jones. Stephen Jones Fall/Winter 2011. Image: Stephen Jones. 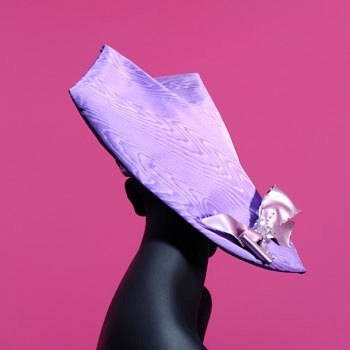 Recommended fabrics: For hat: crisp fabrics with body and a slight stiffness such as faille, taffeta, gazar, or firm velvet. For lining: softer fabrics. Notions: 0.4 m ( about 16″) of 5 cm (2″) satin ribbon; #5 (2.5cm) petersham ribbon; elastic (optional). Trimming: 0.65 m (about 26″) of 5 cm (2″) ribbon; small sequins, sugar beads, and diamantés for bow embellishment. U.K. milliner Sharon Bainbridge has made a version of the SHOWstudio hat; read her process post here. In this ‘Nice Package’ you have indeed presented us with a challenge 😉 for which I thank you.